When you are a migratory species, time really does fly. Birds of prey across North America are heading south for the winter and will be at their highest concentration for viewing in the next couple of weeks. 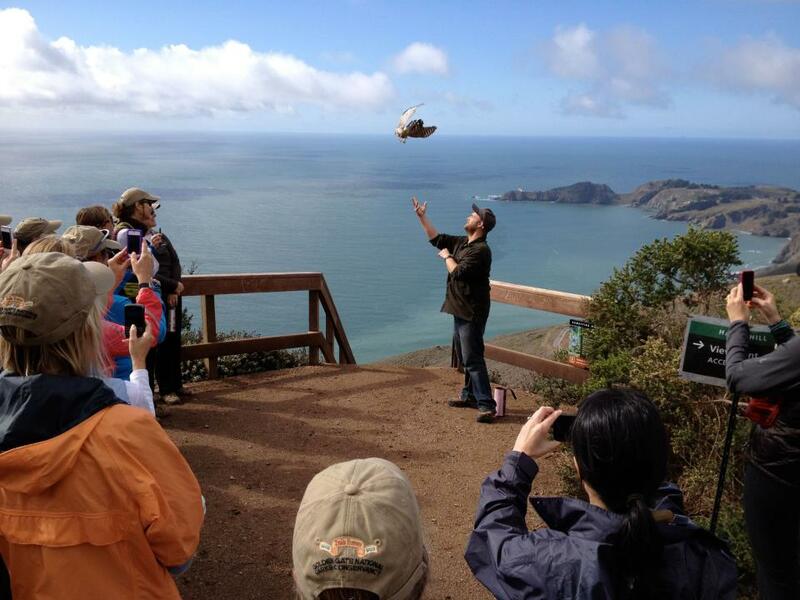 On a relatively clear day, Hawk Hill in the Marin Headlands is the place to be for raptor lovers. More raptors fly through this area than anywhere else along our country's Pacific coastline. The most common raptors to be seen alongside the Golden Gate at this time include: red-tailed hawks (Buteo jamaicensis), red-shouldered hawks (Buteo lineatus), Cooper's hawks (Accipiter cooperii), sharp-shinned hawks (Accipiter striatus), American kestrels (Falco sparverius) and peregrine falcons (Falco peregrinus). In the last ten years at the Marin Headlands, 28,587 raptors were seen on average per season. 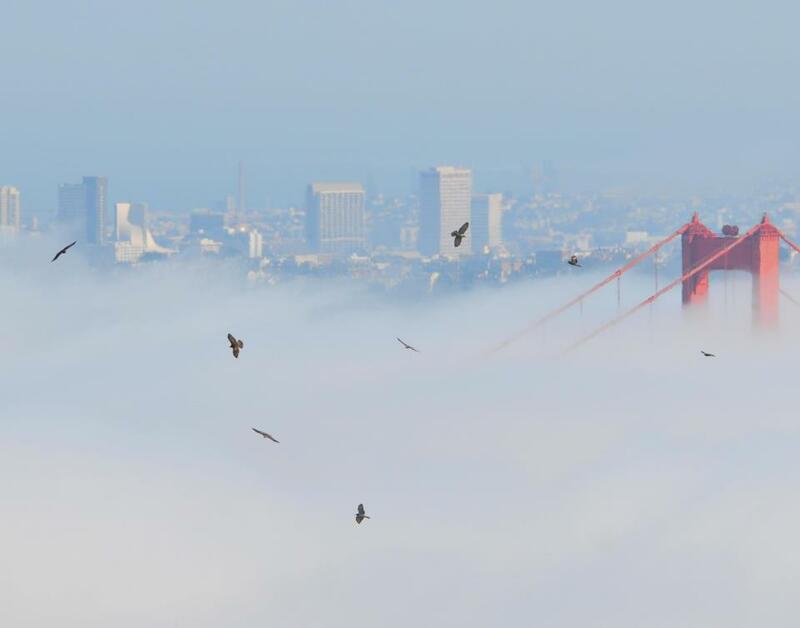 This seasonal spectacle is monitored by the Golden Gate Raptor Observatory (GGRO). Its "Hawkwatch, Banding and Telemetry" volunteers help collect important data for studies, which is interpreted by staff and docents atop Hawk Hill for the public. Throughout the season, visitors can also watch a raptor be released after banding. For two decades, GGRO has been collecting data on these aerial predators to find trends in these migrating populations. This year, the organization will be studying rodenticides in hawks; predators such as raptors are greatly affected by these toxins after consuming contaminated prey. In the past few weeks, four red-tailed hawks have also been tagged with transmitters that use GPS and GSM technology, allowing the public to view the birds' movements from an online map. Last year, the organization worked with researchers at University of California, Davis to re-examine West Nile Virus in raptors. Other topics GGRO has studied include parasite loads and lineages amongst red-tailed hawks and the movement of these migrating birds through VHF telemetry. Raptor enthusiasts are encouraged to donate to and volunteer with GGRO, but the general public can help with these studies too. 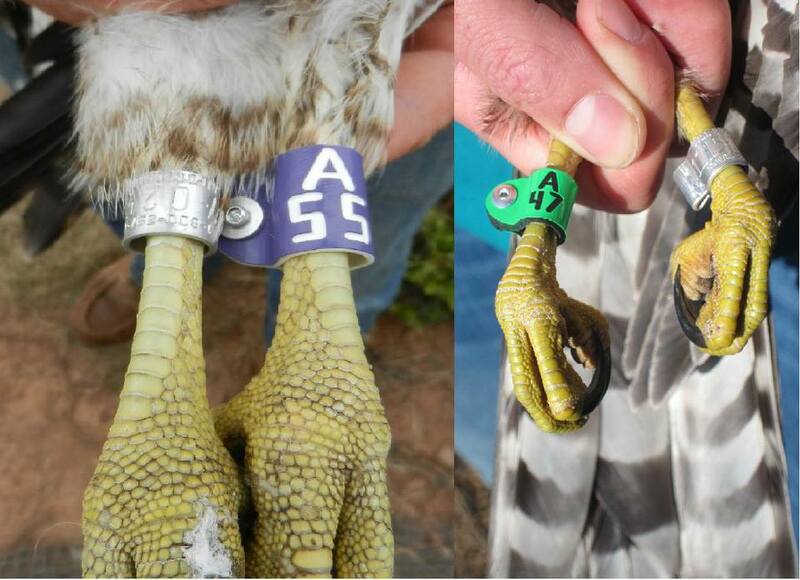 For the first time, GGRO is issuing color-coded bands on two common raptor species for easier identification. Lavender bands are being placed on red-tailed hawks and green bands are being placed on Cooper's hawks. With the public's help, these birds can be spotted, identified by species simply by their band color, and their band number along with which leg is banded can be reported to the Bird Banding Laboratory. Happy raptor viewing and see you on the hill!